Mr. Samblis hasn’t taken PNCH into bankruptsy yet. Mr. Samblis hasn’t done a reverse split yet. Mr. Samblis hasn’t increased the authorized share count yet. Mr. Samblis hasn’t posted any embarrassing pictures of himself in the last few days. Mr. Samblis hasn’t posted on LieHub yet today. Mr. Samblis hasn’t made any announcements yet today of deals he will later rescind. The PPS has not moved into 4-zeros. The Outstanding Share count has not reached 4-billion yet. If you should know of any others, please feel free to use the comment link at the top-right of the article to add to the list. The latest Q report is out, and many are asking… is it time ! It’s a question any loving pet owner asks themselves when they are watching their beloved pet’s health deteriorate. As a loving pet owner you just hate to see your pet suffer. There comes a point in which you have to start thinking about euthanizing the pet in order to end their suffering. This analogy could be applied to PNCH also. Take a look at the below chart (O/S data taken from reports listed here). It’s plain to see that if the current trend regarding Outstanding Share (O/S) count increases continues, the O/S count will need to be increased to at least 5-Billion in order to meet the demand for operating funds by June of 2014. Now, Mr. Samblis indicated a while back that the reason he increased the Authorized Share (A/S) count to 4-billion was so that there could be a better than 2 to 1 margin of A/S to O/S. He indicated this was needed in order to obtain more favorable rates for borrowing money. So… if the current trend continues, by June we could see an A/S increase to 10-Billion ! Can the company survive raising the A/S count to 10-Billion ??? Do you now see the relationship mentioned above relative to suffering? When is enough… enough ? Some of the events of late are simply a desperate attempt to hang on. Just like you spend thousands trying to keep your beloved pet alive just a little while longer… so is Mr. Samblis doing for PNCH. Only he is not spending his money… he is spending investor’s money. If money were not a concern, many pet owners would spend anything to keep their pet alive. And while keeping their pet “alive”… what is the quality of life for the pet? There are times, and circumstances, in which all the money in the world is not enough to save them. Many times all you do is prolong death instead of finding a cure. 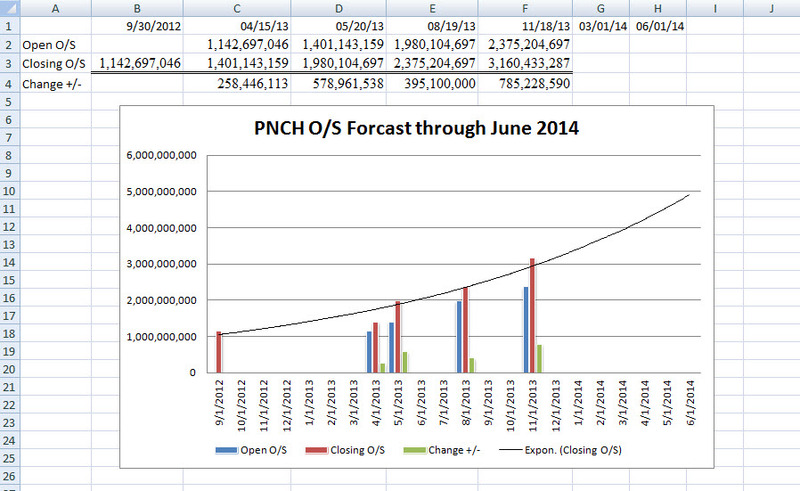 Unfortunately with PNCH, many point to the CEO as the root cause of the deterioration. The business plan is viable, however it appears all the money in the world can not cure the ill with PNCH. There just doesn’t seem to be a will to succeed. To succeed, many CEO’s will tell you, when you start thinking you’re the smartest guy in the room, the end is in sight. Any good CEO worth their salt has good advisers surrounding them… and they heed their advice ! Mr. Samblis appears to have now discarded his previous statements regarding when and where he will inform the investors and public regarding the events of PNCH. Recently he has taken to posting again on LieHub. Of all places to go back on your word… he chooses LieHub. These actions appear to be simply desperate actions to pump the PPS so that more shares can be sold to keep the company alive a little while longer. Does anyone think that if Mr. Samblis had good advisers surrounding him they would have advised to go on LieHub and advertise your business ? Its doubtful Mr. Samblis will voluntarily give up anytime soon… after all, its not his money he is wasting. He will likely pursue success as long as he can find investors willing to invest based on his overly inflated promises (what many call lies). However the pool of potential investors will likely remain small or non-existent as more and more information about his actions become more commonplace for research. Could PNCH be saved… of course, its possible, but that is highly unlikely while the current CEO remains in control, and acts foolishly. Mr. Samblis’s actions have brought this company to where it is today, and the trend has been a steady decline for quite some time now, and that is unlikely to change unless the change starts at the top. Mr. Samblis likes to point to anyone other than the man he sees in the mirror for the decline, but the simple truth is… HE made all those decisions. As just one example, HE chose to do business with Collins, and it should of been HE that prevented Mr. Collins from being able to deceive him. As the boss… it’s you’re obligation to know what is going on. As Reagan put it… trust, but verify ! So… is it time to put PNCH down? It’s been a loving passion for many, and still is for a few, however as difficult as it may be… it may be time ! Maybe bankruptcy, name change, and a reverse split all together may give the company a new start, but give a bad driver a new car and they will bang that one up also. Censorship is alive and well on the Hangout ! WOW… censorship is alive and well over on the Investors Hangout (PNCH) board, and some even say the practice is rampant. Take a look at the graphic below. We received this as a result of a request to the poster. The original post was deleted very shortly after it was posted. In addition to reading and giving thought to the content of the post, take a look at the last line. As the writer states, he has written about the issues outlined within the post before, so apparently there was really noting new in the post, and certainly the events referred to are public knowledge. However… take a look at the last line, where in response to our request for the text of the post, the writer indicated the reason he was given as to why the post was deleted. AND… equally as disturbing is that someone with deletion power complied ! One would think that if the post was within the guidelines of the TOS (with reference to others that are allowed to stand), any MOD, Asst MOD, or Admin would have declined the request by the CEO to delete the post. Now, here is another post that was deleted. Read this post and ask yourself should this post have been deleted. We suspect this post was deleted on direction of the CEO also. Again, in our opinion, this post should not have been deleted. Did it contain unflattering information, yes, was it someones opinion, yes, but slanderous, no. In fact, the MOD of the board responded, as can be seen in the graphic below, indicating “Lots you said true.”. Normal TOS guidlines call for the deletion of any reply posts to a post that was deleted, yet this reply post stands. Why ??? Maybe those quick to hit the delete button might want to understand the difference between a bashing post, and a post that contains opinion from dissatisfied investors. Just because a post is unflattering to the stock, doesn’t mean its bashing the stock. If you want to see bashing, take a look at the post below. These posters are prolific bashers. They make up lies, negatively twist valid information to suite their own personal agenda, use profanity, and slander the CEO in just about every post. They profess loudly that they do it because they like it, and they think its their civic duty to destroy Mr. Samblis and his company. Posts (and posters) like these post for no other reason then to destroy the stock. They have no compassion for the investors that are currently invested in the stock, and became investors because they wanted to. There is plenty of DD on this company if you care to look, so it must be assumed that these investors knew what they were doing when they invested. That should be respected, not ridiculed as bashers do. Now the above post is certainly far different from a dissatisfied investor. Dissatisfied investors are simply expressing their opinion, albeit negative, but none the less they express their opinion just like the supporters do. Its fair to assume that readers know the difference between a bashing post and a post from an upset investor. Most are adults, way past 21 and can decide for themselves what they want to read and what they don’t want to read. There is a function on the board called ignore also. If readers didn’t want to read posts from those THEY consider to be bashers… they can put that poster on ignore. It should be the readers decision… not the Admin, Mod, or Asst Mod making that decision for all members. And certainly NOT the CEO ! Readers need to know that apparently Mr. Steven Samblis, CEO of IC Punch Media is deciding what readers are able to see. Mr. Samblis has posted earlier that he will not be posting on message boards any longer because of what he alluded to was an inability to control the content, so he stated he would be posting only on his Facebook page… apparently because he CAN control the content. Mr. Samblis’s practice of attempting to control the content the investors sees, only adds to his creditability issues. 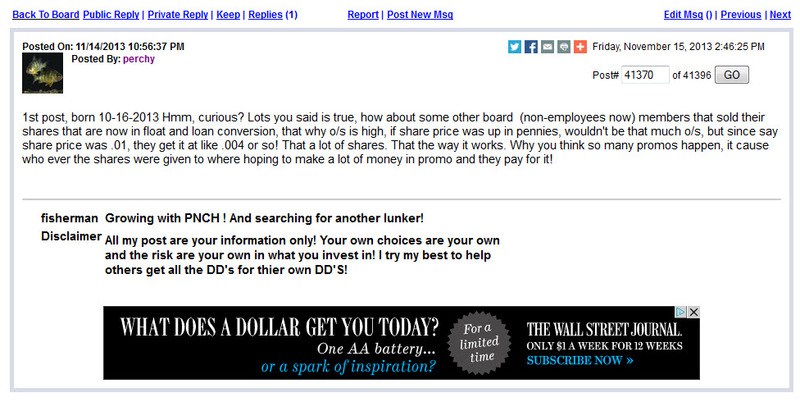 So… if/when you read the Investors Hangout (PNCH) board… just know you are likely reading censored information. Check the numerical post numbers on the left hand side of the page to see if posts have been deleted because someone decided for you that it wasn’t something you needed to see. Shameful… just plain shameful ! Doubtful ! If the estimates that have been indicated by Mr. Steven Samblis are accurate, the cost to change the symbol is somewhere around the $15,000. mark. Everyone knows, or should know, that Mr. Samblis keeps the company running by selling stock to finance day to day expenses, and also… cheap shot coming… his bar tab. So, it is conceivable that in order to do a symbol change he would need to sell stock to pay for it. Today, the PPS was for the most part of the day sitting at .0001. In order to sell enough stock to pay for a symbol change at that price, Mr. Samblis would need to sell 150-million shares of stock to pay for the change. Doubtful he will do that unless or until the PPS increases….which seems unlikely anytime soon. Given the PPS lately, Mr. Samblis has likely had to sell more and more of the company’s authorized shares to pay the ongoing expenses of the company, and, his personal compensation as CEO. Mr. Samblis had posted previously that there were some months where he would need anywhere from $15,000. to $40,000. to run the company per month. Now given the recent decline in the company’s activities its unlikely he is needing that much every month now, however its fair to assume he needs some amount of money to operate the business’s day to day operations. Mr. Samblis likely has personal expenses to meet also, and the funds to pay those expenses likely result from selling stock also. Where else could the money be coming from if not selling stock? The company has no revenue (according to the last few filings), so unless he has a part time job somewhere, the funds come from selling stock. So… at the recent PPS average, it’s conceivable that Mr. Samblis is selling somewhere between 25 and 50 million shares of stock every month (and that’s assuming he only needs $5,000. a month). Of course the quantity sold would be adjusted accordingly based on then current PPS and amount of cash needed. As the PPS declined, Mr. Samblis was forced to sell more and more shares of stock just to meet the same level of monthly expenses. The low PPS is killing shareholder investment twice… once because their investment value is decreasing as the PPS decreases, and again when Mr. Samblis needs to dilute at a greater and greater level to meet the fixed monthly expenses, given that share value is worth less. Shareholders will likely be shocked at the increase in Outstanding Shares when the quarterly report is released in a few days (or maybe longer if an another extension is filed). Remember, as the PPS falls, a larger number of shares needed to be sold to meet the fixed expenses. Mr. Samblis’s back is likely against the wall. He is caught between keeping the company afloat by selling more and more shares, thereby diluting the company into oblivion, or increasing the Authorized Shares (A/S) in order to be able to hold on a little while longer. However he likely knows that increasing the A/S count at this point will be the death blow to the company. There is always the Reverse Split (R/S) option as a last ditch attempt at attracting new investors that wouldn’t normally touch a stock selling in the tripple-zero’s, however he likely knows that a R/S would also be a death blow to the company. What is a CEO to do ??? Well, one tried and true option would be to find a tactic to keep shareholders hanging on until he can perhaps make the VU Television Network thing generate some revenue. Enter the pseudo-CEO messenger. If Mr. Samblis can find someone he can convince to promote his business using pseudo-information fed to them on the condition they not release the details, that person will spread the word that something really big is happening, and shareholders should not only hang on, but buy more a these low prices. Hopeful shareholders will likely latch on to anything because they want to have hope that they have not lost everything with their investment. The CEO feeds the ego of the pseudo-CEO messenger by telling them he is confiding in them some secret information that will blow the lid off this stock… BUT… they can not release any details to the public. ONLY the pseudo-CEO knows this information, therefore they feel special, and powerful, knowing they have information that no one else has. The pseudo-CEO will say things like he has inside information that he can not release… but trust them… it’s the truth because they heard it straight from the CEO. This is an extremely useful and effective tactic for CEO’s to use. They plant the rumor, but then have deniability so they can not be held accountable for misleading investors. Think about it… use your common sense… if the information being “secretly” spoon-fed to this person was valid… why would this information not be worthy of a press release. Remember… Mr. Samblis needs buyers for the shares he needs to sell in order to meet his financial needs. At these low prices, potential buyers need to be incentivized to not only buy more stock… but not sell the shares they hold because those sales would be competing against the company’s for the small pool of buyers. Confidence in Samblis takes another hit ! ClearVision announces today that it will be launching at Cleveland Hopkins International Airport. We believe that makes 4 so far (per here). Mr. Samblis has stated previously that when the company reached the 5th airport his company would be profitable on the deal. Although no one knows if the profitability part of his statement is correct… it appears the part about the number of airports on-line by the end of the year is not. The number of airports statement appears to be another truth fail. Granted, perhaps back in March Mr. Samblis was speaking to the best of his knowledge at the time, however, now we have more information about other aspects of the deal that appear to be less than accurate, or truthful as some may say. Now we have the ability to look at several statements in total. We liken his statements about the deal to Obama’s statements on being able to keep your health care plan…PERIOD! Did Mr. Obama know the truth at the time, or was he using the best information he had available to him at the time. Some say Mr. Obama MUST of known it was untruthful, as it was his signature piece of legislation, and as such he would want to be intimately involved with the important aspects of it. We feel the same concept applies with Mr. Samblis… the ClearVision deal is his signature accomplishment, as Mr. Samblis has said as much in various posts and statements along the way. So… did Mr. Samblis know the real truth? Look closely at the Clearvision release linked above. You will notice that the content will not be available at the airport until “early 2014“. Since Clearvision is releasing this news today, it’s a fair assumption that this is the next airport to go on-line. If this is the next airport to go on-line, and it will not BE on-line until 2014… its also a fair statement (conclusion) to say, there will be no more airlines coming on-line in 2013…. i.e. there are 3 and that’s it for 2013. So Mr. Samblis’s statement of there being 12 on-line “by year end“… appears to be inaccurate. Not only inaccurate a little… but a lot. Missed the mark by 75%. We also know now (according to this post) that the amount of revenue Mr. Samblis indicated would result from the deal was apparently way off also. Off by some 90%. Mr. Samblis likely read the many posts referencing the $192K revenue amount, and, responded to some where that amount was referenced, yet he remained silent about the amount… i.e. letting the falsehood remain in investors minds. Fast forward to recently where the above linked post states the amount is grossly overstated… and Mr. Samblis still remains silent. It’s a fair assumption (here again, conclusion) that if the 19K figure were incorrect, Mr. Samblis would have been quick to rebut the figure. We also know now that this deception is a pattern. If each incident were to be debated by itself, one could make a case that Mr. Samblis deserves the benefit of the doubt. However… when the statements are viewed together, in totality, its plain to see a pattern has developed. There are numerous statements that fall into the category of what many call untruthful. There are also many more instances of where MR. Samblis remained (or remains) silent in the face of repeated questions regarding the many major issues in question, such as dilution, the China deal, failed launch, etc, etc, etc. So… given the above, it begs the question… what CAN we believe from Mr. Samblis? Well, we can believe the facts, i.e. what events that have happened in the past, we can believe our eyes (as in the case of pictures), we can believe (independently) documented reports, and there is always our gut. Our gut is not scientific… but for most of us it has a good track record of being right. At this point this company doesn’t need revenue to pick itself up, as much as it needs a truthful CEO. If investors had confidence that the CEO was straight with them, we suspect the PPS would be much higher than .0002 (up from .0001 yesterday). Rich or poor, the worst thing any man can do is squander his integrity. slicrick50: “jealous”… try insulted, swindled, deceived, mislead, outright lied to, and just all around pissed off! “Steve makes his own money and can spend it anyway he see’s fit.” In concept we would certainly agree, HOWEVER… unless Mr. Samblis works at WalMart on the weekends… it’s NOT his own money, its investor money ! Anything Mr. Samblis does, Hollywood Fast Lane etc. included, is as a result of investor money. And since IC Punch Media is not showing any profit, OR simple revenue currently, where else is “his” money coming from? Everyone is aware that the Authorized Share amount has doubled over the past year or so, and the Outstanding share count has constantly risen in every quarter for many consecutive quarters. Mr. Samblis is funding/financing IC Punch Media (VU Television Nertwork) with investor money via share sales (convertibles). Even Mr. Samblis has admitted using shares to run the company, i.e pay expenses to keep the company afloat (while at the same time asking investors to focus on his statements that he has not sold “personal” shares in over a year). 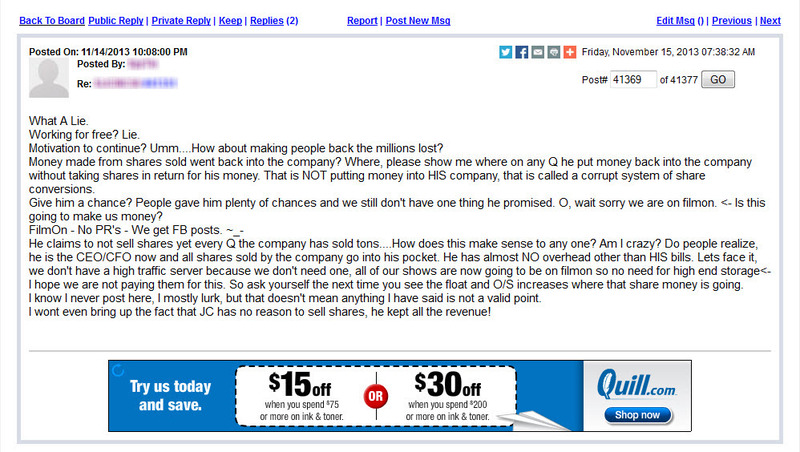 No, of course he is not selling his own personal shares… he is selling YOUR shares. He sells investor shares while maintaining his personal stash just in case the PPS does move north – he still maintains his insanely large share count. In fact, because he inserted language into his employment contract that he must maintain a controlling share of the outstanding shares, he just issues himself more personal shares when he runs low on investor shares and needs to print more. Much like the government printing money when they run out of what they printed previously, so they can spend even more. In fact, the sale of convertibles actually works in his favor, as the more convertibles he sells, the higher his personal share count must increase to maintain the majority control. And… even if it were true that Mr. Samblis is working at WalMart on the weekends making “his own money”… as a CEO of a public company that is swimming (drowning) in red ink, the optics of those pictures do damage to the company’s investment prospects. Potential new investors doing their DD on the company, and seeing the financial losses being incurred, then seeing how the CEO spends the investment dollars of his current investors, will likely not go anywhere near this stock. We suspect that is the reason they were deleted from the Investor Hangout site. Those pictures were not favorable to the cause, and in fact were damaging to the cause – and the MOD that deleted them knew this. They were deleted just like many other posts are deleted because they are viewed by some (MOD & assistant MOD’s) as unfavorable, and therefore arbitrarily deleted so others could not see the information. People arrived at the Hangout because they didn’t like the censorship on LieHub, only to arrive at the Hangout and find the very same thing going on, only in a different direction. Wrong is wrong regardless of the justification. “If doing things that could bring investors, partners or buyers to the table should be a good thing, I would think.”. Here again, in concept we would agree, however it didn’t appear those were “investors, partners, or buyers” in those pictures ! If, for instance, Alki David we laying in bed next to Mr. Samblis … then MAYBE the viewer could assume some business was being conducted, however it didn’t appear there were any investors anywhere near the area where any of those pictures were taken. If Mr. Samblis had an ounce of public relations intelligence in him, he would have never posted those pictures, even if he was on his own personal time, using his own personal money. That is the point of this entire post (and replies). This is but one more example of why Mr. Samblis needs to step down as CEO, and let control of this company pass to someone who has a business sense for turning companies around. The concept of a broadcasting company who’s primary distribution channel is aimed at emerging technology is a sound one, and possibly a highly profitable one. However, just because it may be a good idea doesn’t mean it will automatically be successful in spite of a CEO at the helm that is making mistake after mistake and not taking responsibility for his actions (and in-actions). Even a great idea can be squandered into oblivion. So there is the CEO of IC Punch Media, Mr. Steven Samblis, living the high life on the investor’s dime, or more accurately, investors thousands of dollars. His company’s stock price is sitting at .0002 and he looks real concerned doesn’t he. Looks like IC Punch Media is simply the vehicle that allows Mr. Samblis to hob-knob with the Hollywood wannabe’s. Some say he keeps the company going, and works so hard because he cares about the investors. Take a look at the pictures and decide for yourself where Mr. Samblis’s focus is at, and where he devotes his energies toward. Without IC Punch Media, his pickup line of… hey ladies, I own a broadcast company and I can make you a star, couldn’t be used. Mr. Samblis NEEDS the company to maintain his lifestyle, and to impress the ladies. VU Television Network is not going anywhere, until and unless a better meal ticket comes along ! Just add these picture to the pile of red flags already there. The pile is so tall you likely can’t see over it.